As we are approaching Christmas, everyone's thoughts turn to getting their Christmas crafting done. Everyone except me, that is! I have three more presents to knit, so what do I do? I cast on three projects that AREN'T Christmas gifts. I cast on three projects for myself. Oh well, you can't resist the crafting muse when she smacks you on the back of the head with a knitting needle, now can you? 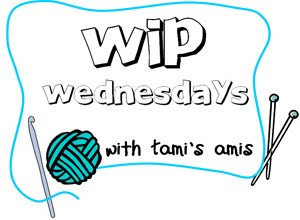 Admittedly, one of the three projects I cast on was lightening fast, and is already finished, but that still leaves two new projects added to my WIP list. My WIP list is getting rather unwieldy of late. Ah well. Can't be helped (well it can, but I don't really care). The first of the new projects, I have justified to myself as essential. This is because it is now cold and I obviously need a new hat, what with already having completed one already this year and having several from previous Winters. I have justified it to myself as being necessary to co-ordinate with my new scarf/stole in purple (which I've just realised I haven't blogged about yet - doh!). I bought the yarn a month or so ago because it went perfectly with the new scarf/stole. 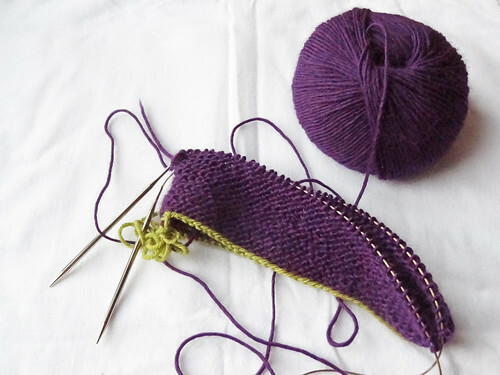 The yarn is Rowan Creative Focus and it is a lovely deep purple colour. 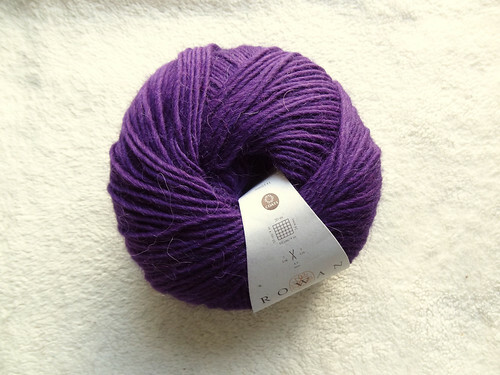 This yarn is new this year from Rowan and is 75% wool and 25% alpaca. It is a worsted weight, which is not a common weight of yarn in the UK, which will make it useful when substituting yarns in American patterns. I thought using this yarn for a hat would be a good way of testing out the yarn and it's properties. So far I am enjoying knitting with it. Though the yarn is loosely spun, the hairiness of the alpaca means the fibres all stick together which helps reduce any tendencies to split. I think it will result in a warm and light hat. The hat I'm knitting is Fortnight by Jared Flood. I decided to use an accent colour on the cast on edge, like one of the samples, so I used a little bit of the yarn left over from my Camden Cap. 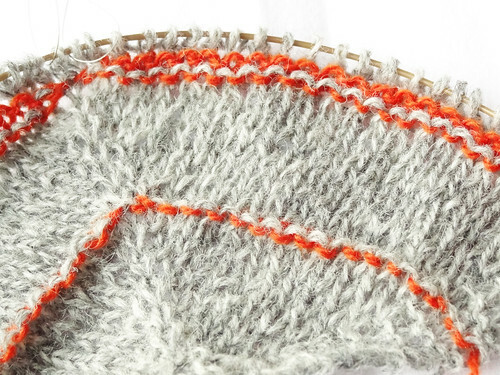 I've also added in the short row shaping around the back of the hat to provide extra ear and neck coverage! I really love that pop of lime green against the dark purple. I had a few problems ensuring the wrap and turns of the short row shaping remained hidden in the stitches, probably because it's the first time I've used garter stitch short row shaping in the round. I ended up knitting the wrapped stitch together with the stitch before and then knitting front and back into the next stitch to bring the stitch count back to the right number. It seems to have done the trick. I'm pretty sure there is a better way to achieve the same result, but I don't know it, and this looks ok, so I'm not going to any more research into techniques right now. The other selfish cast on was a shawl, no big surprise there, I'm sure! I recently bought yarn for a Merging Ripple Shawl from Knitscene Winter 2012. I love Kyoko Nakayoshi's design and the short rows really appealed to me. 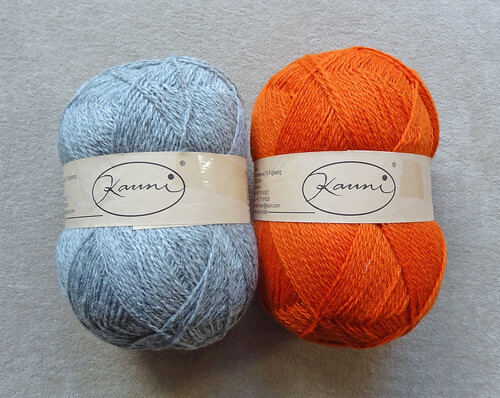 I got some Kauni Wool 8/2 Solids in Orange and Grey, to knit it. I love how these two colours contrast. I was about to cast on this pattern when I looked at the finished size and realised that it wouldn't be as big as I wanted. The shawl was knit bottom up and I couldn't be bothered to do the maths needed to make it bigger at the start of the project. It was pure laziness on my part, and I hope that I get round to doing the maths at some stage to make the bigger version, as it is a lovely design. As I had the yarn out all ready to cast on, I wanted to find a quick replacement project. I found it in my favourites on Ravelry. It is Pterodactyl by Marc Smollin. It's a triangular shawl, which I normally avoid, but as I intend to make a huge version of this shawl, I think it will wrap around me just fine. 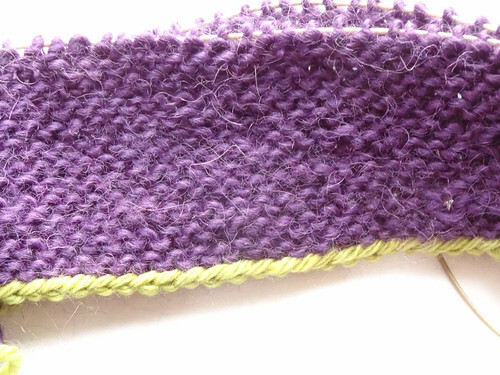 The pattern uses short row shaping to create wedges of contrast coloured garter stitch. The wedges increase in size throughout the shawl to create an usual item that I think will be very striking when finished. I love this yarn. It is so woolly. 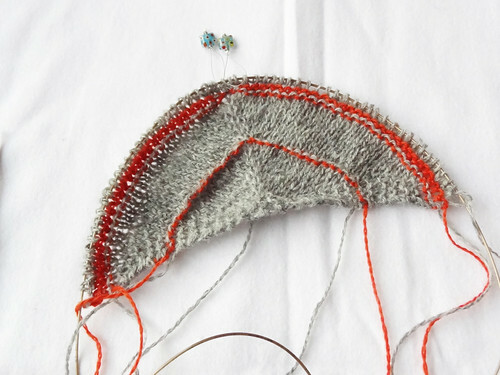 I used the striping version of this yarn to knit my original More Than A Triangle Shawl. It blooms beautifully when washed and softens significantly. My original shawl, knit in this yarn, has yet to accumulate a single "pill" despite being worn all the time for the last 2 years. It's a great value yarn in some lovely colours. I am going to enjoy knitting this shawl a LOT! If you would like to look at other new, or existing projects, being currently worked on, click on the button.